Game One Preview: Hey, Remember CC Sabathia? Giants fans have reasons to feel good right now: After an injury-filled preseason and an awful Week One performance in Washington, they've won two straight, including a road game at Philadelphia. Do those two games mean that all concerns go away? Of course not: Beating the Eagles doesn't heal Terrell Thomas's ACL. 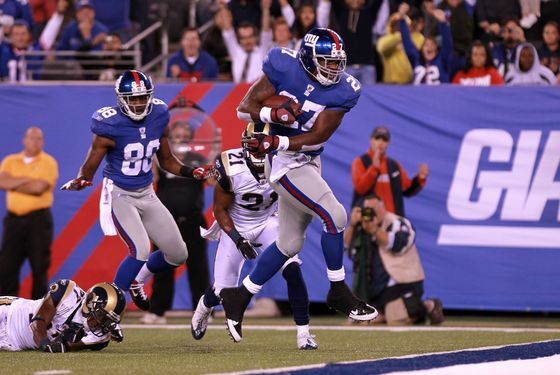 But if you haven't believed in the Giants all along, Brandon Jacobs has some words for you. "Well, the only thing that matters are the people on this football team and in this organization believe in this football team," Jacobs told reporters after practice. "The people outside that want to say they're fans and don't believe in us, I [cannot] care less if they ever believe in us. "They don't mean anything to us if they don't believe in us. They can go back and finish living their miserable lives that they've been living and hoping that we lose." Now, of course, "believing in a team," is something of a cliche, and a non-specific one at that: It might mean believing that a team could win, or believing that a team will win, or maybe something else entirely. (And needless to say, the part about "their miserable lives" is uncalled for.) But it sounds like Jacobs is also misunderstanding the nature of fandom: Rooting doesn't necessarily mean pretending that things are all right when they're not. Again, the concept of "believing in a team" is pretty vague, so we don't want to put words into Jacobs's mouth. But there's a suggestion that fans who recognize flaws in a team (which might cause them to "believe" less than they otherwise would) are somehow something less than fans who "believe" no matter how many members of the secondary get hurt. Which isn't even to say that the Giants might not actually be better than they've been given credit for — that's another debate entirely. (It's also not to say that fans aren't fickle.) But this feels like a cousin of the Antrel Rolle "you don't boo your team" conversation. At the end of the day, the more games the Giants win, the more fans will "believe" in them. They've won two in a row, and have some winnable games coming up. The first of those comes on Sunday, when they'll face the buzz-saw that is the Arizona Cardinals. And while the Giants are coming off an impressive win in Philly, Arizona is coming off a 13-10 loss at Seattle. (The game, as we're sure the broadcast team will mention more than once on Sunday, will be played in Glendale, at the site of Super Bowl XLII.) If you'd stopped believing in the Giants, Jacobs apparently has no use for you. But regardless, that doesn't mean you can't start believing again.